Diabetes prevention is as basic as healthy eating, exercising and losing weight. Join Nurse Practitioner Tarnia Newton, NP, to learn how a few simple changes in your lifestyle can help you avoid the serious health complications of diabetes, including kidney and heart damage. 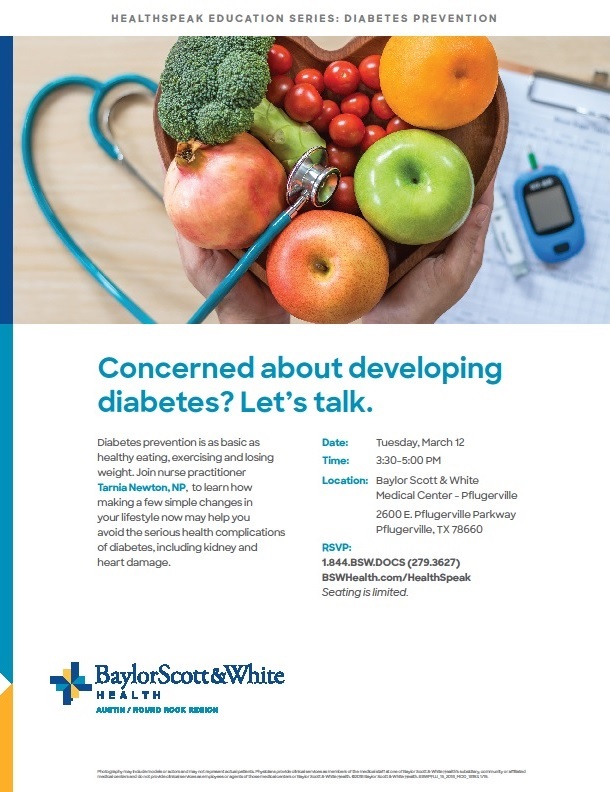 This free Baylor Scott & White HealthSpeak Education Series talk is scheduled from 3:30 to 5:00 p.m. Tuesday, March 12, 2019, at Baylor Scott & White Medical Center – Pflugerville, 2600 E. Pflugerville Parkway, Pflugerville, TX 78660. Seating is limited. Please RSVP online at BSWHealth.com/HealthSpeak or by phoning 844.BSW.DOCS or (844) 279-3627.